The walls of New York are covered with murals that evoke the city’s history, celebrate its neighborhoods, pay tribute to leaders great and small. 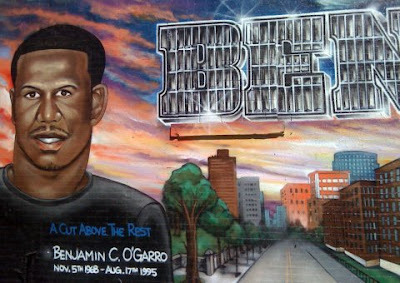 And then there’s the mural at the corner of Vanderbilt and Myrtle Avenues, which commemorates Benjamin O’Garro, a controversial figure who is still beloved by some in Fort Greene, even if he represents, in many ways, the neighborhood’s troubled past. But according to reports from The Times and the Daily News, “Killer Ben” was a notorious presence in the Walt Whitman Houses, one who allegedly dealt in drugs and whose gun play once sent a neighborhood child into a coma. In 1988, he was convicted of attempted murder for shooting at two police officers from the 88th precinct with a Tech-9 pistol. While O’Garro was serving an attempted murder sentence upstate, his 3-year-old brother Ben Williams was killed when someone — possibly a rival drug gang — shot up the O’Garro apartment in a hail of bullets. That same week, in July of 1990, two other children would be killed by gunfire on city streets. The older Ben returned to New York in the mid-90s, just as Fort Greene — and the rest of the city — had begun the long process of rehabilitation. But he would never have the same chance at redemption. On Aug. 17, 1995, he was shot dead in a telephone booth outside the Whitman Houses. As Ian Frazier wrote in the New Yorker last year, O’Garro may have been murdered because he stole jewelry from an associate of the rapper Notorious B.I.G, another son of Brooklyn who would die violently before the age of 30. “We can’t really judge him,” cautions Bio Feliciano, who painted the first O’Garro mural 10 years ago with two other members of Tats Cru, a renowned collective of graffiti artists. Feliciano says he subsequently learned the details of O’Garro’s violent past, yet when O’Garro’s family approached Tats Cru to restore the mural last year, he did not refuse. Like the countless other young men Tats Cru has immortalized, the image is not a statement of morality, but a sad note on the lives — however imperfect — this city claims daily. Family members recall O’Garro fondly, refusing to believe that he was responsible for any of the bloodshed that found its way to their very doorstep. His sister Jamilla Martin, 34, says that her older brother had a “great heart” and often played the part of Robin Hood, buying bikes for his younger siblings or reaching out to help struggling neighbors. Any money he earned, Martin claims, came from working as a manager for musicians like the rap duo Eric B. and Rakim.